Soul Of A Nation: Jazz Is The Teacher, Funk Is The Preacher-Vinyl. Just fifteen months after the release of their critically acclaimed compilation Soul Of A Nation, Soul Jazz Records release the much-anticipated followup Soul Of A Nation: Jazz Is The Teacher, Funk Is The Preacher as a three LP set. It covers the period between 1969 and 1975, which was an important period in modern American history and also in music. The release of Soul Of A Nation: Jazz Is The Teacher, Funk Is The Preacher will coincide with the opening of the Soul Of A Nation–Art In The Age Of Black Power exhibition at the Brooklyn Museum, New York and then Los Angeles in 2019. These two cities will be the latest to host the critically and commercially successful exhibition that opened at the Tate Modern in London in 2017. Back then, Soul Jazz Records had just been released Soul Of A Nation, and now comes the followup, Soul Of A Nation: Jazz Is The Teacher, Funk Is The Preacher. There’s fourteen groundbreaking tracks on Soul Of A Nation: Jazz Is The Teacher, Funk Is The Preacher which were released between 1969 and 1975 and feature the various Afrocentric poly-rhythmical styles of music that was popular in America. This included everything from free jazz, proto-rap, radical jazz and street funk which was music with a message. The artists on Soul Of A Nation: Jazz Is The Teacher, Funk Is The Preacher explore Black Power and civil rights’ inspired notions of self-definition, self-empowerment and self-respect and which they practised in their own lives. Among them were two pioneers of the experimental jazz movement who bookend the compilation. The Art Ensemble of Chicago opens Soul Of A Nation: Jazz Is The Teacher, Funk Is The Preacher with Theme De Yoyo-O. It features a powerful and impassioned vocal from soul singer Fontella Bass. Bookending the compilation is Don Cherry’s Brown Rice. Both tracks showcase musical pioneers who were creating radical and groundbreaking music that was way ahead of its time and introduce new elements to jazz music. This included the civil rights concept of freedom and the black power ideas of self-respect, righteousness and anger. Meanwhile, The Har-You Percussion Group, which was a group of young Harlem teenagers, used government-sponsored social initiatives to create art and music. This included their genre-melting 1969 eponymous album which featured Welcome To The Party. It’s a melting pot of musical influences. So was the music created by two collectives that feature on Soul Of A Nation: Jazz Is The Teacher, Funk Is The Preacher. The Pharoahs’ Damballa is taken from their 1971 album The Awakening, and Detroit’s Tribe contribute Beneficient. Both groups fuse deep jazz and street funk to create innovative music that sadly, didn’t find the audience it deserved. Neither did Gary Bartz NTU Troop’s who contribute the cosmic cult classic Celestial Blues. Another cult classic is The Oneness Of Juju debut album African Rhythms which features Space Jungle Funk. These tracks offered spirituality and cosmology to record buyers. Sadly, James Mason’s debut album Rhythm Of Life is another cult classic that failed to find the audience it deserved first time around. It features Sweet Power, Your Embrace, which is one of the highlights of an album that belatedly found the audience it deserved within in Britain. Very different is the poetry of Gil Scott-Heron and Sarah Webster Fabio. Gil Scott-Heron contributes Whitey On the Moon which is full of social comment. So is Sarah Webster Fabio’s Work It Out which is performed with a backdrop of street funk and heavyweight percussion. These two poets with their proto-rap sound are provided the template for rap later in the seventies. P-Funk pioneers Funkadelic contribute Nappy Dugout where they showcase their hyper funk psychedelic sound. It’s a welcome addition, and so is Hard Times by Baby Huey and Byron Marris and Unity’s Kitty Bey. They’re joined by Rashied Ali and Frank Lowe’s Exchange, Pt. 2 on Soul Of A Nation: Jazz Is The Teacher, Funk Is The Preacher which is the latest lovingly curated compilation to be released by Soul Jazz Records. Just like, Soul Of A Nation, the much-anticipated followup Soul Of A Nation: Jazz Is The Teacher, Funk Is The Preacher features familiar tracks, leftfield choices and hidden gems. They’re a reminder of what was a hugely important and in some cases, frustrating and turbulent period in African-American history. 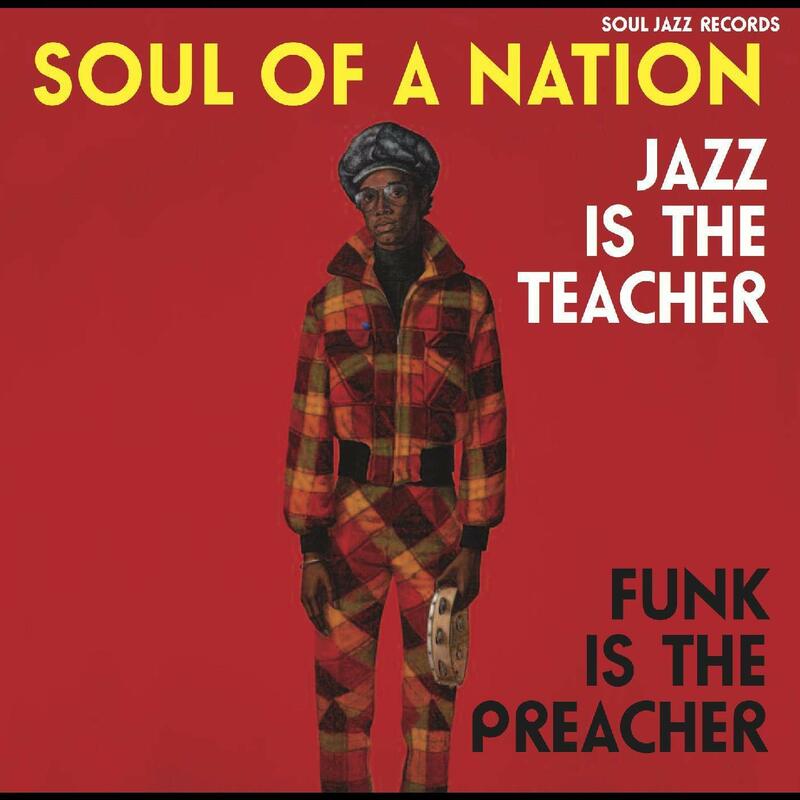 Tagged: Soul Jazz Records, Soul Of A Nation: Jazz Is The Teacher Funk Is The Preacher. ← PAUL BUCHANAN-FROM THE BLUE NILE AND BEYOND.